SEVEN people were burnt beyond recognition in a horrendous accident 15 km north of Otjiwarongo on the Otjiwarongo/Otavi B1 road on Wednesday. The accident happened at about 13h30 when a Toyota Quantum long distance transport bus travelling to Otavi allegedly overtook a vehicle and collided head-on with a Toyota pickup truck travelling to Otjiwarongo. The Quantum was carrying 17 people and caught fire on impact, with the fire spreading rapidly to the pickup, with only the driver. Five adults and two children perished in the fire, with 10 passengers, including a two-year-old baby girl, and the driver of the pickup escaping death. The survivors were taken to the Otjiwarongo State Hospital with injuries of various degrees. 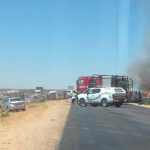 Warrant Officer Maureen Mbeha of the Otjozondjupa Police confirmed that a case of culpable homicide was opened and that the driver of the pickup, Ruben Shihelekeni, 48, and the driver of the Quantum, Hangula Gotlieb, 34, were identified. Mbeha said the Otjozondjupa police is now calling on members of the public who have relatives who were travelling and did not arrive at their destination to contact the Otjiwarongo police to assist in the forensic examinations for possible identification of the deceased persons.